London has been blessed with a sensational summer but like all good things it must soon come to an end. Make the most of the final days of the season at London’s best summertime activities. AFTER weeks of blissful sunshine the temperature is now on the decline and it’s once again necessary to take a brolly every time you step foot out the door. Before the historically warm season fades to a distant memory, here are our top five ways to make the most of the remaining summer days. Pull on your togs, throw a towel over your shoulder and head to a coastal getaway right here in London. 150 tonnes of sand has been dumped on the Roundhouse terrace together with deck chairs and beach huts to create an inner city slice of paradise. Completing the pseudo-seaside is a pier offering traditional games, tasty food and ice cold drinks. Get groovy on the sand with acoustic and DJ gigs every Friday night. Entry is free and surfs up until August 24. Embrace your inner Forest Gump at a ping pong table near you thanks toPing! – an initiative bringing the sport to the streets for free. Bats and balls are supplied, all you need is a bit of technique. If hand-eye coordination is not your thing, sit back and watch the pros at a showcase match. It’s game on until 30 August. On August 25-26 head to West London to experience an assault on the senses – the sight of glitzy and glamorous costumes, the sound of Calypso music and the smell of Caribbean food. Held each August Bank Holiday since 1966, the Notting Hill Carnival is the largest street festival in Europe. 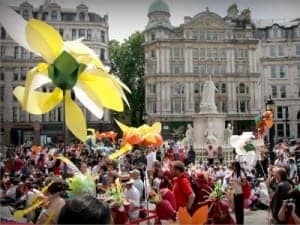 The spectacle celebrates London’s multicultural past and present with two days of live music, street floats, jerk chicken and fried plantain. You don’t need to live at Southbank to be part of this celebration. The Festival of Neighbourhood is all about coming together and with a program of events, activities and workshops there are plenty of ways to do just that. Here street art and performance combines with quaint English gardening and home cooking. Get involved or watch on while enjoying the sunshine until 8 September. Shakespeare is going cheap – a fiver is all it will cost you to stand in the yard for a performance at London’s Globe theatre. As you’ll be exposed to the elements it’s a must-do London experience best enjoyed in the summer. Matinee and evening performances to The Tempest, A Midsummer Night’s Dream, The Taming of the Shrew and Macbeth are on sale now. It’s best to book ahead and take your chance on the weather. What’s your favourite thing to do in London in the summer?